Last, add some ribbon, twine, or fishing wire and hang it on a tree! Here’s a quick snapshot of one of my tree. Forgive the quality of the photo, the wine made my hands shaky…I needed it to help me watch Sound of Music LIVE! And to help me deal with the glitter…all over the house. 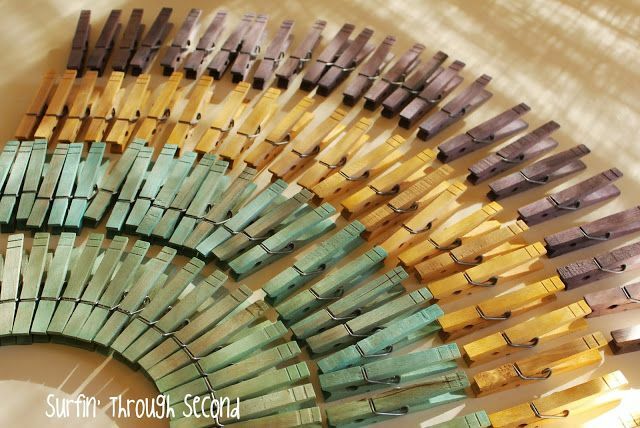 Then add the medium sized clothespins by gluing them in the middle of the large ones like the picture above. Once the medium sized clothespins are glued down the center you will glue the mini clothespins down the center of the medium clothespins. Go back over your candle with your fine glitter (the glitter that is pictured in the supply picture). Let your candle dry. I like to leave mine on a piece of parchment paper to dry so it doesn't stick to the surface and lose glitter in the process.